This .45 ACP ammunition from Winchester is an ideal training load for 1911s and other .45 Auto pistols. 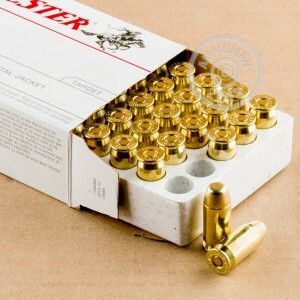 Each cartridge in this case of 500 fires a light 185 grain full metal jacket bullet at an above-average muzzle velocity of 910 feet per second. 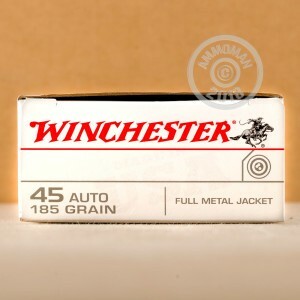 Winchester "white box" ammo delivers inexpensive and reliable performance for any target shooting purpose. It is loaded in Oxford, Mississippi and uses non-corrosive Boxer primers and brass cases. 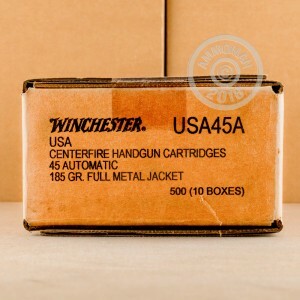 Grab this 500 round case (or any other items totaling $99 or more) and get it shipped free from AmmoMan.com to your doorstep! GREAT PRODUCT. A LOT EASIER ON ME AND MY PISTOL THAN 230 GRAINS.